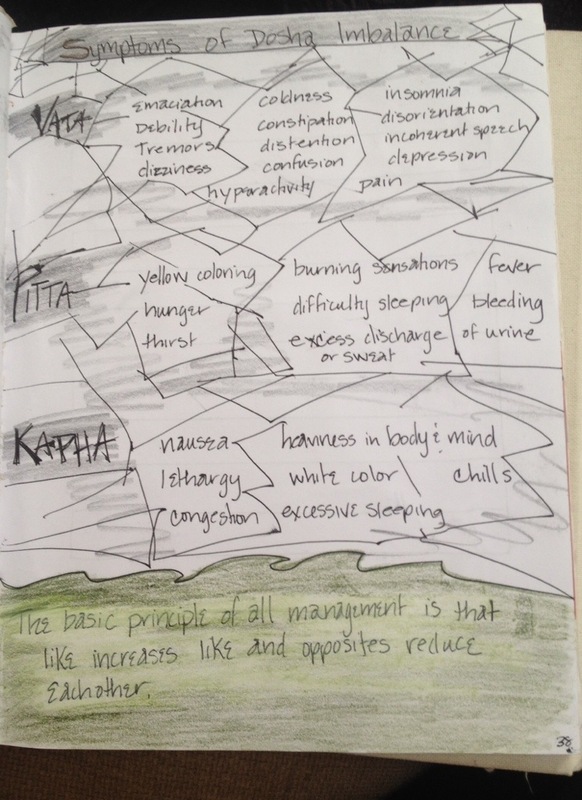 A Delicate Balance–Ayurveda Part 2. This isn’t a post about what your dosha is. You can find fairly accurate quizzes for knowing your dosha from various sites on-line (far more accurate than buzzfeed quizzes plaguing facebook for which I am grateful while breastfeeding at 3 in the morning). What’s a dosha? In case you aren’t part of the yoga world, it’s your body/mind type according to Ayurveda. Here is a decent place to check out what your individual constitution or dosha may be. Once you understand your body/mind type, you can begin to make steps towards bringing more balance to your life–what Ayurveda is all about. Health is a delicate balance between your body, mind, spirit & the elements around you. 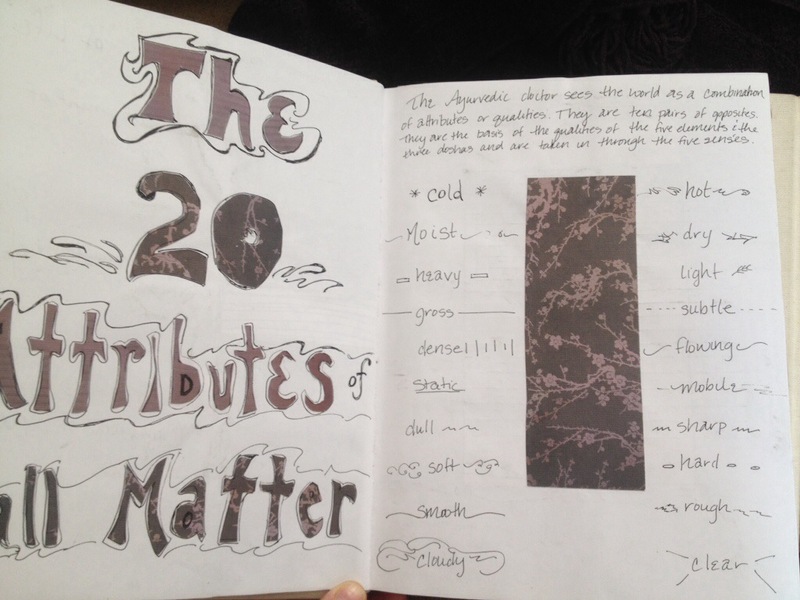 I don’t really have any great pictures of the 20 attributes of matter. This is from my California College of Ayurveda notes. It gives more insight into the whole balance thing. If you are a naturally cold person, you want to eat foods & incorporate practices that keep you warm, if you are someone who tends towards sweating & oily skin, you will need to take in (through the 5 senses) things with dry qualities to balance you out. Each individual has their own set of qualities that they are naturally predisposed to–this is your constitution or dosha. This doesn’t change. But just because your constitution is vata, pitta, or kapha does not mean that your imbalance can not have different qualities from that. 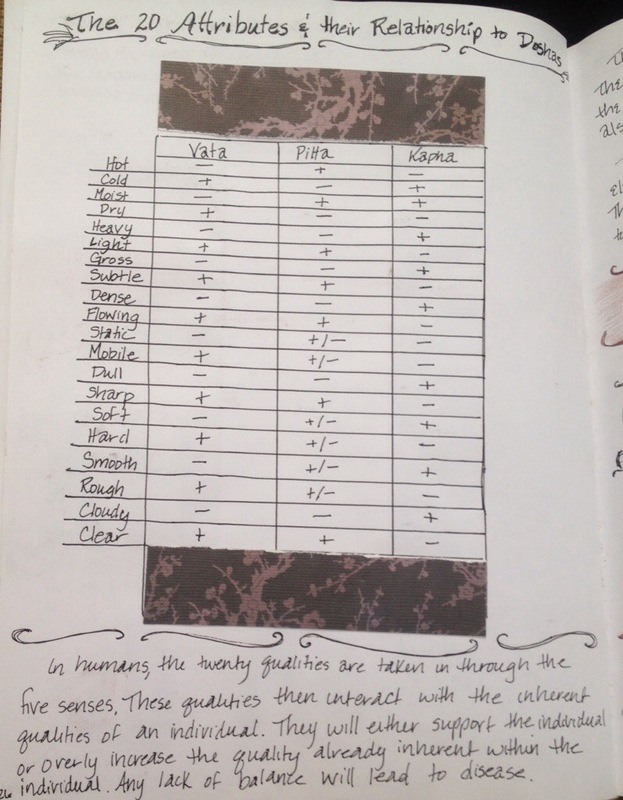 So a vata might have a pitta imbalance. Or a pitta might have a kapha imbalance, etc. We take in these qualities through our 5 senses. They then interact with the inherent qualities within each individual (vata, pitta, kapha). They work to either support balance within the individual or overly increase the quality inherent within the individual. ANY lack of BALANCE will lead to disease. The disease can manifest over time & symptoms arise. The vata dosha is responsible for motion in the body. Like it’s elemental components, its qualities are rough, light, cold, dry, mobile & subtle. Within an individual, vata creates these qualities and then the body reflects these qualities and assumes this constitution. When vata increases, the primary symptom is pain &/or excess motion–twitching, rapid breath, rapid heart. While vata can be present anywhere in the body, it’s primary locations are the large intestine (gas anyone?–vata imbalance! ), pelvic cavity, bones, skin, ears, & nerves. The pitta dosha is the force in the body that is responsible for digestion and metabolism. It’s represented by the elemental force of fire. It’s principal quality is heat, and it is also light, slightly oily, unstable, and sharp. The nature of the pitta individual reflects these qualities. Pitta imbalances usually affect the small intestine, lower stomach, blood, sweat glands, eyes, skin, liver & spleen. The most common symptoms of pitta imbalance are fever & inflamation in the body. Kapha is the force behind structure and stability in the body. It’s made of water & earth, and its qualities are heavy, moist, cold, static, smooth, and soft. Kapha imbalances are primarily found in the upper half of the stomach, the chest, throat (think coughing and phlegm! ), plasma, liquids and synovial membranes. The primary symptom of excess kapha is swelling. So, if you notice one of these symptoms developing, as quickly as possible, you want to increase qualities that are opposite to the dosha to maintain balance and also health. Symptoms occur when we have been imbalance for quite a while (usually). Our bodies are amazing! I don’t even think I realized how amazing until after having a child. They are constantly working toward health, towards supporting our life. Ayurvedic lifestyle practices are meant to maintain balance & support the body for ideal health. Next post2/52–Month 3, week 4.